If a company wants to buy another company or has been approached by a company that wants to buy them, either company’s law department might like some guidance as to which law firm to retain. Since large deals announce the law firms representing both sides in mergers and acquisitions, companies compile the data. The New York Times published some of that data regarding M&A legal advisors through the second quarter of 2014 (July 1, 2014 at B8). The firms are Allen & Overy; Blake, Cassels; Cleary Gottlieb; Davis Polk; Freshfields; Jones Day; Latham & Watkins; Simpson Thacher; Skadden, Arps; Slaughter and May; Sullivan & Cromwell; Willkie Farr; Wachtell, Lipton; Weil, Gotshal; and White & Case. Together, these fifteen firms accounted for a significant chunk of the nearly $1.77 trillion worth of deals announced in the first six months of 2014. 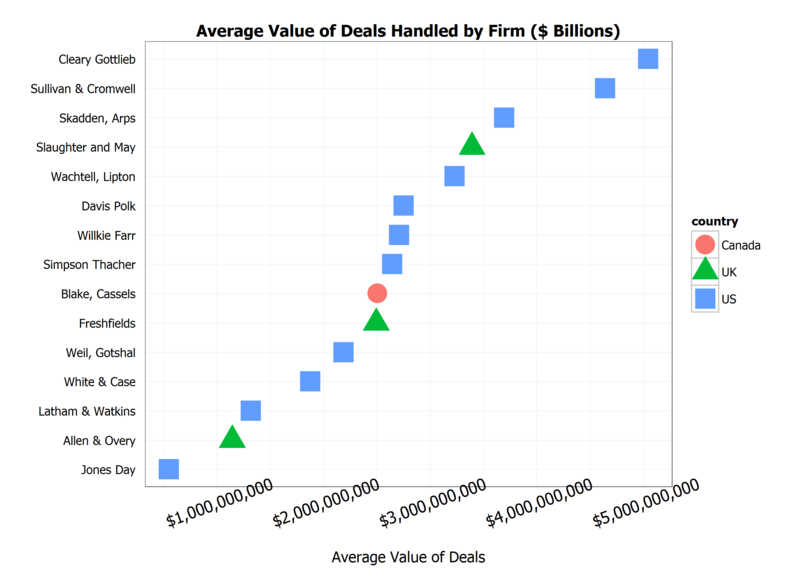 Let’s present the M&A data on leading law firms using graphs. The first graph shows the 15 law firms and the number of deals on which they have been retained.